Taskinas Creek, a low-gradient, meandering tidal stream, snakes its way through York River State Park within the Chesapeake Bay National Estuarine Reserve in Virginia. A small subestuary of the York River is located on the river's southern side. The Taskinas Creek watershed is representative of an inner coastal plain rural watershed within the southern Chesapeake Bay system. fresh water. 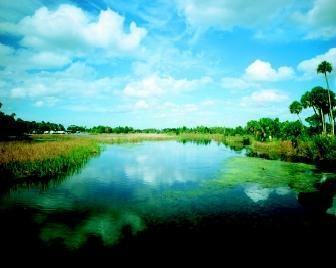 The fresh-water sources for most estuaries are streams, rivers, and even groundwater for some areas. In the continental United States, estuaries comprise more than 80 percent of the coastline along the Atlantic Ocean and Gulf of Mexico, and more than 10 percent of the Pacific coast. Geographical features such as bays, inlets, harbors, lagoons, bayous, and sounds usually are one of several different types of estuaries. Although there are many ways to classify estuaries, geomorphology and water circulation are features commonly used for characterizations. Most estuaries can be grouped into four geomorphic categories based on the physical processes responsible for their formation: (1) rising sea level; (2) movement of sand and sandbars; (3) glacial processes; and (4) tectonic processes. 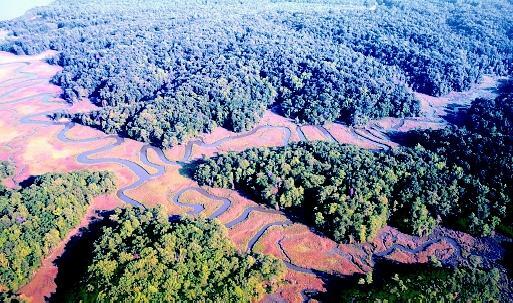 Drowned river valley or coastal plain estuaries were formed by rising sea level during the last interglacial period (about 15,000 years ago) which flooded river valleys that were cut into the landscape when sea level was lower. Chesapeake Bay (Virginia and Maryland) and Galveston Bay (Texas) are classical examples of this type of estuary. The movement of sand and formation of sandbars along the coastline can enclose bodies of water and form lagoon-type or bar-built estuaries such as Laguna Madre, Texas. In colder climates, glaciers cut deep valleys in the landscape. When glaciers recede during warmer climate periods, coastal waters fill the valley to form fjord-type estuaries, which are common in New England and Alaska. Water circulation characteristics may also be used to classify different types of estuaries. The movement of water in estuaries is regulated by the ebb and flow of tides; differences in the density of water; and wind. Because most estuaries are influenced by lunar tides, the once-daily (diurnal) or twice-daily (semidiurnal) rise and fall of water results in a net flow out of the estuary. In the strictest sense, estuarine circulation usually refers to the residual water movement after the short-term tidal effects are removed. Thus, circulation is the time-averaged current in an estuary and is sometimes described as net current, nontidal flow, or tidal residual. The density of water also plays a major role in the movement of water in estuaries. Density, which is the weight per unit volume of water, increases with increasing salinity and decreasing temperature. In an estuary, the lighter fresh water mixes with the heavier salt water from coastal waters and creates a gradient in water density in the estuary. As the fresh water gains salt, becomes heavier, and sinks, the resulting movement of water is known as gravitational circulation, and is caused by density and elevation differences between the fresh-water runoff and saltier coastal waters. In some estuaries, large differences in water temperatures can also drive gravitational circulation. Although several classification systems based on estuarine circulation modes have been proposed, most estuaries can be placed in one of four different categories: (1) classical; (2) reverse; (3) discharge; and (4) storage. Classical estuarine circulation involves the net movement of lighter, lower-salinity water along the surface and out of the estuary while heavier, higher-salinity water flows into the estuary along the bottom. This results in a two-layered circulation system with net water flow out at the surface and in along the bottom. Reverse circulation occurs when evaporation rates exceed fresh-water input rates, which usually happens in arid climates. In these estuaries, the salinity of the water in the estuary may be higher than in the coastal waters. Thus the net circulation in a reverse estuary is in at the surface and out along the bottom, which is opposite that of classical estuarine circulation. Some estuaries, such as the mouth of the Mississippi River, receive such large volumes of fresh-water input that the net flow is out of the estuary at all depths. This type of circulation is referred to as discharge circulation. Storage circulation is an infrequent mode that occurs when the net flow is into the estuary at all depths. In reality, many estuaries shift circulation modes depending on the season, fresh-water input, and major meteorological events (e.g., hurricanes and other large storms). Influence of Winds and Rivers. Florida's Crystal River Estuary is a popular tourist destination with ecological, historical, and archaeological significance. The Crystal River State Buffer Preserve provides a protective buffer against development for the nearly pristine St. Martins Marsh Aquatic Preserve. St. Martins Marsh is one of the best examples of a spring-fed estuary remaining in the ever-developing state. waters. Persistent winds can push large volumes of water to one side of the estuary and raise the water level along the downwind shoreline. Gravity acts upon the mound of water so that water flows in the opposite direction (away from the shoreline) along the bottom (downwelling). Similarly, the water level along the upwind shoreline may fall as the wind blows water offshore. Deeper waters flow in to replace the water that is pushed away from the shoreline (upwelling). Rivers bring fresh water into the estuary. The fresh-water travel time slows as it mixes with estuarine water. Thus, the water spends some time in the estuary before it gradually exits into coastal waters. The hydraulic residence time of an estuary is the time required to replace the equivalent amount of fresh water in the estuary by fresh-water inputs. In short, it is the time that a molecule of water spends in the estuary. Estimates of residence time are useful for calculating the movements and concentrations of dissolved substances, such as nutrients or pollutants , in the estuary. Of course, the residence times within a particular estuary vary depending on many factors, including fresh-water input, circulation, and bathymetry (depth characteristics). Each estuary is unique with respect to physical, chemical, and biological characteristics, but estuaries share many common features. For example, rivers provide a continuous input of sediment into the estuary. Turbidity is a measure of the amount of suspended particles, which includes fine sediments, in the water. Circulation within the estuary redistributes the suspended sediment and a turbidity maximum usually is located in the region of the estuary where fresh water from the rivers contacts the more saline coastal waters. Chemical interactions between the sediment particles and dissolved ions in sea water result in an attraction between particles that causes the particles to stick together (flocculate). The heavier and larger particles settle out of the water column and are deposited on the bottom. Over time, these deposits may fill navigation channels. Dredging is the periodic manual removal of sediment to keep channels open for navigation. In some estuaries, dredging is controversial because it may have negative effects on the biota (living plants and animals). Once the sediment is dredged, it is usually deposited nearby in specially designed diked areas. The removed sediment deposit is called dredge spoil. Traps for Pollutants and Sediments. Most estuaries are very efficient at retaining dissolved and particulate matter. In this respect, estuaries are often thought of as filters or traps that are located between the land and the sea. Because these systems are so efficient at retaining these substances, they are very susceptible to pollutants that are washed into the estuary. Organic and heavy-metal pollutants typically have a long residence time in estuaries and tend to accumulate over time. Organisms in the estuary are exposed to elevated concentrations of these pollutants, and many species accumulate these compounds within their organs and tissues by the processes of bioconcentration and bioaccumulation. Human consumption of marine life is prohibited in many estuaries due to the toxins which have accumulated in seafood. Once pollutants are introduced into an estuary, they are very difficult (or expensive) to remove. Therefore the best strategy is to minimize the input of these compounds. Estuaries are ecosystems that play an important role in coastal food webs . High rates of primary productivity supply the food and energy to support valuable fisheries for oysters, crabs, shrimp, and a variety of fishes. The diverse habitats and water characteristics in estuaries provide refuge for the larval and juvenile stages of many fresh-water and marine species, and therefore are considered important nursery areas. The wide range of salinity and chemical conditions, coupled with high primary productivity and assorted habitats, creates environments that support many different species. Therefore estuaries are noted for their high biological diversity. Many estuaries in the continental United States are experiencing eutrophication, which is an increase in the rate of organic matter input into an estuary, and the associated biological responses. The sources of organic matter may be from outside the estuary in the form of terrestrial plant material or dissolved organic matter. Organic matter also is produced from within the estuary by phytoplankton , macroalgae, and sea-grasses. High rates of nutrient inputs from land runoff stimulate phytoplankton production and thereby increase the rate of organic matter input in the estuary. One of the primary symptoms of eutrophication is low dissolved oxygen concentrations in the water, which may lead to large fish and shellfish kills due to insufficient oxygen concentrations for aerobic (oxygen-dependent) respiration. Eutrophication also has been blamed for an increase in the number of harmful and sometimes toxic phytoplankton blooms in estuarine and coastal waters. Numerous studies are underway to determine ways to assess the health and integrity of estuarine ecosystems to help resource managers develop more effective ways to protect and preserve this valuable resource. SEE ALSO Algal Blooms, Harmful ; Algal Blooms in the OCEAN ; Bays, Gulfs, AND Straits ; Biodiversity ; Chesapeake Bay ; Coastal Ocean ; Coastal Waters Management ; Ecology, Marine ; Ocean-Floor Bathymetry ; Ocean-Floor Sediments ; Sea Level ; Tides ; Wetlands . Alongi, Daniel M. Coastal Ecosystem Processes. Boca Raton, FL: CRC Press, 1998. Hobbie, John E., ed. Estuarine Science: A Synthetic Approach to Research and Practice. Washington, D.C.: Island Press, 2000. Mann, K.H. Ecology of Coastal Waters with Implications for Management, 2nd ed. Malden, MA: Blackwell Science, 2000. National Research Council. Clean Coastal Waters: Understanding and Reducing the Effects of Nutrient Pollution. Washington, D.C.: National Academy Press, 2000. * See "Bays, Gulfs, and Straits" for a photograph of San Francisco Bay. I like the picture, it is really pretty. thank you for understanding that slow people need a visual aide when reading long boring articles. This report really helped me when I was studying estuaries for my biology class. It is very detailed and thorough, and it explained the different abiotic properties of estuaries very well. Thank you. you really need what the climate is on this website. ... Marsh is one of the best examples of a spring-fed estuary remaining in the ever-developing state. waters.